For the hosts, all-rounder Krunal Pandya and left-arm pacer Khaleel Ahmed were handed T20 debuts. 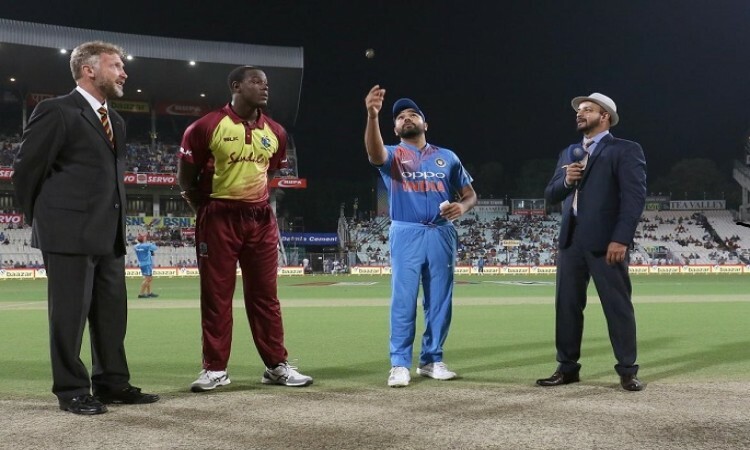 During the toss, Rohit said frontline fast bowler Bhuvneshwar Kumar complained of a gastric issue and is expected to be fine for the next match in Lucknow. For this tie, Bhuvi has stayed back at the team hotel with Umesh Yadav replacing him, while off-spinner Yuzvendra Chahal was also left out. For the tourists, Oshane Thomas, Fabian Allen, Khari Pierre earned their first caps. This is the first time that the West Indies are playing a T20 bilateral series in India. The Windies return to the scene of their stunning 2016 World T20 triumph, beating England by four wickets in the final where Carlos Brathwaite hit four sixes in the last over to turn the tide miraculously in their favour.